The incandescent light bulb or incandescent lamp makes light by passing electric current through a wire filament in a glass envelope filled with an inert gas. The filament resists the electrical current and produces a glow (incandesces). One of the by-products of this production of light is heat. Incandescence is the emission of light (visible electromagnetic radiation) from a hot body due to its temperature. The term derives from the verb incandesce, to glow white. There are a number of factors to decide when selecting incandescent lights. 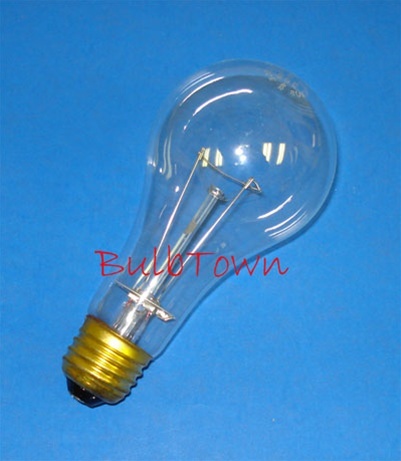 Fortunately, BulbTown has a wide selection of incandescent bulbs of various amperage, wattage and bases. We also simplify the process by allowing you to select for what purpose you need the incandescent light bulb. You can select whether you need sign bulbs, "A" bubs, make-up mirror bulbs or more! And you can be assured when you buy incandescent light bulbs from Bulb Town, you’re getting a quality bulb matched with superior customer service. So whether you’re looking for "A" bulbs, makeup mirror bulbs or sign bulbs, you’re sure to find it at Bulb Town!.